A brand new project for this year sees Mick joining forces with four world-class musicians who, after years of touring and recording with some of the most iconic bands in the world, bring you a great new show highlighting some of the best British Rock and Pop music of a generation. 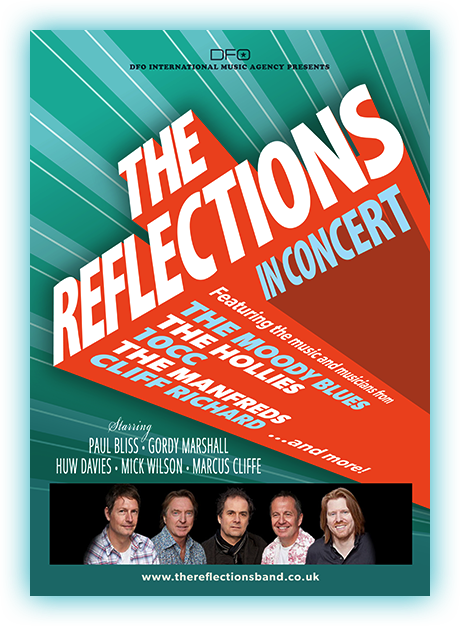 The Reflections consist of current and former members of THE MOODY BLUES, THE HOLLIES, 10cc, THE MANDFREDS, CLIFF RICHARD and THE WAR of the WORLDS and deliver hit after hit, with some of the greatest songs of these bands and artists. On tour in the UK in May and June with a warm up gig in Feb, this isn’t just a covers band - these guys ARE the band that helped make these high-profile acts sound so good live and on record......see gigs page for tour dates. For more information on the band and upcoming tour, click here to go to The Reflections website.